the media and the gossip trees of the LDS Church. I want to give a shout out of thanks to the few of our readers who didn't waiver and who employed their reading comprehension skills to determine that our original article wasn't off base. The new Deseret News Article that now appears online is written VERY different from the first one, IMO."Ms. Bishop: After today's discussion and review, the following actions have been taken with regards to the story within which your blog is referenced. 2. In tomorrow's published newspaper we will run the following correction: "The Preparedness Pro blog site reported that self-service canning would cease at LDS canneries east of the Mississippi at the end of June. 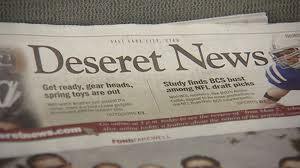 A story in Tuesday's Deseret News misrepresented the report. The Deseret News regrets the error." These responses are consistent with Deseret News policy in this regard. I apologize for the misrepresentation. The fault was mine, and mine alone. I am sorry for any frustration, inconvenience or discomfort this may have caused you. Good on them and you to Kellene. I know you do your best to get out timely info and any one can be wrong from time to time or make a mistake. I do appriciate how you try to give the best info as you know it and with no malice nor axe to grind. Good on the folks at Deseret news for doing the correction. Ah...there was a problem with what I had in the hyperlink. It works now. Sorry about that. Thank you for being on top of this. I am sick, sick, sick of the Elites and their rules. The whole deal from USDA is just another way to drive the public to "Agenda 21". It is creepy-to say the least. I can see volunteers making up lists in invisible ink for "canning parties"; where we secretly can our illegal meat, produce, and other non government supplies. This reminds me of stories I heard from my family about relatives in Nazi Germany, about being afraid of that midnight knock on the door. I cannot believe that this is happening in the Land of the Free. Any chance of more of your yummy recipes soon? Thanks for being honest and open! You're great. So, not to be too confused, I am East of Mississippi (Rhode Island). So, are they shutting down the LDS Canneries? I have used the one in Massachusetts, never canned myself - bought cans all done and bags of food. Are they shutting this down? Are they just shutting 'self-canning down' or ALL purchasing? They are not "shutting down" ANY of the canneries...only stopping canning at them. You will still be able to purchase prepackaged #10 items as you described in your comment. So for you, I dont' think you'll notice a change if that's all you've known thus far.